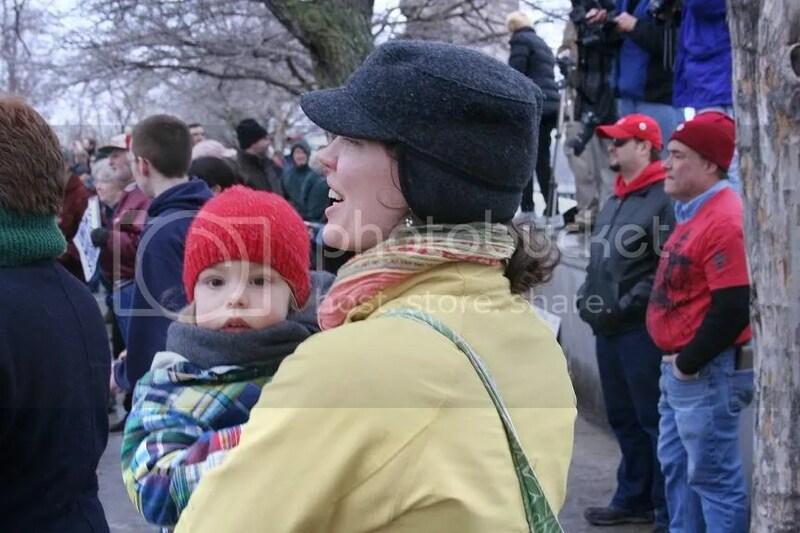 …The left via moveon.org and OFA are organizing protests in Jefferson City this Saturday, so the St. Louis Tea Party Coalition is joining the call from Tea Party and 9-12 groups across the state to counter protest on the capital steps. Speakers are still being scheduled for Saturday. We will meet about 10:30AM to stake out our ground…. We made the drive to Jefferson City, timed to arrive at the capitol at about 11:00 a.m., which we did. The teabagger rally site on the south side of the capitol at 11:04 a.m.
We walked over to the north side of the capitol, the announced site of the MoveOn organized labor rally scheduled for noon. There were a few people gathering. An individual pointed out to the river and told us that there was a bald eagle perched in a tree. 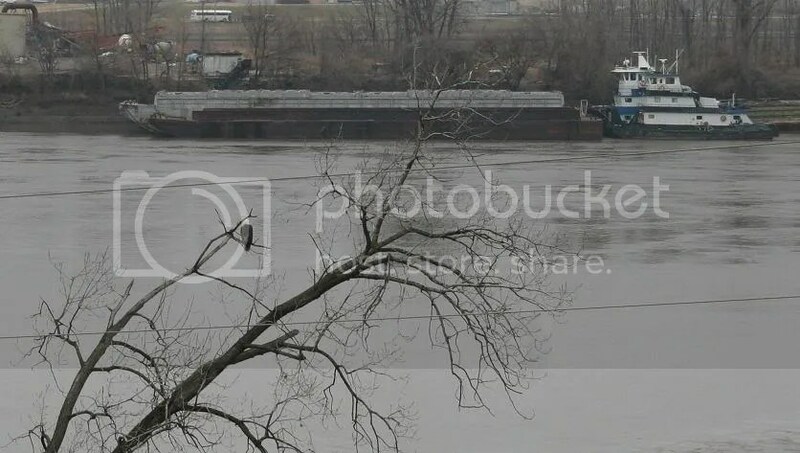 A bald eagle looking over the Missouri River. We can all thank the Endangered Species Act for that moment of Zen. 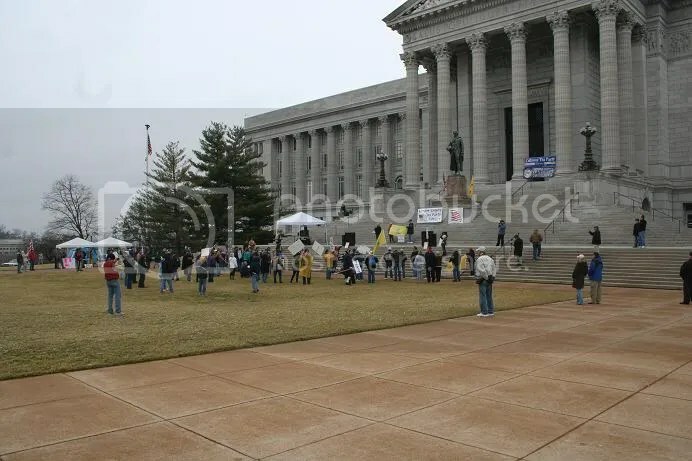 After about fifteen minutes I walked back to the teabagger rally site. They had started. A speaker was droning on about the communists who sponsored the rally on the other (north) side of the capitol. The teabagger rally site on the south side of the capitol at 11:20 a.m.
After a few minutes of teabagger rhetoric I walked back to the north side of the capitol to interview people participating in the MoveOn organized labor rally. And thanks to the teabaggers I had another question I could ask in those interviews. It turns out that MoveOn and the organized labor folks were more punctual. They started at noon. The MoveOn organized labor rally across from the north side of the capitol at 12:02 p.m.
IBEW, Local 2, from St. Louis. Together we bargain, alone we beg. People continued to arrive after the start of the rally. I even heard a few people, laughing, say that they had gone to the south side of the capitol and realized after a few seconds that they were at the wrong rally. The Koch brother are not our kings, don’t let them buy our democracy (left). 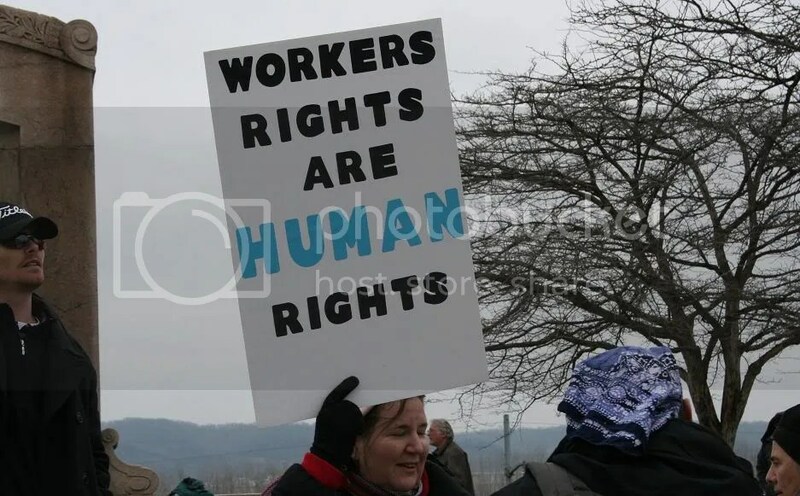 Public or private workers have the right to organize (right). 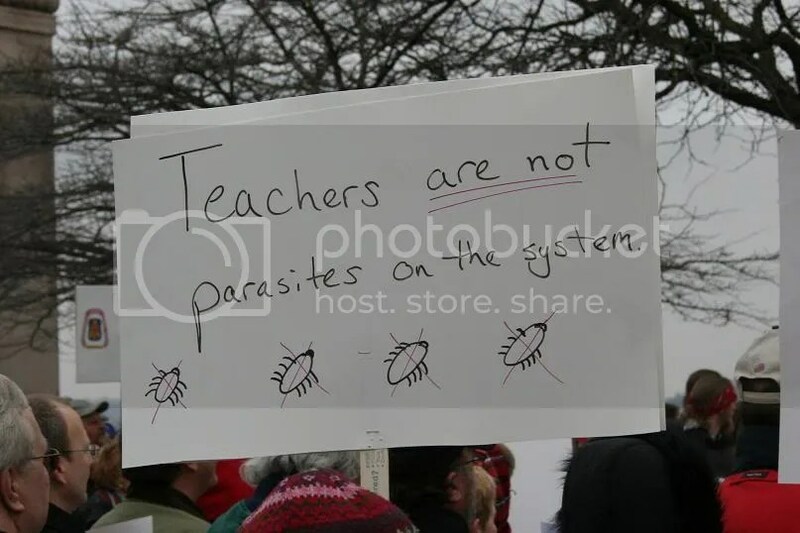 Teachers are not parasites on the system. 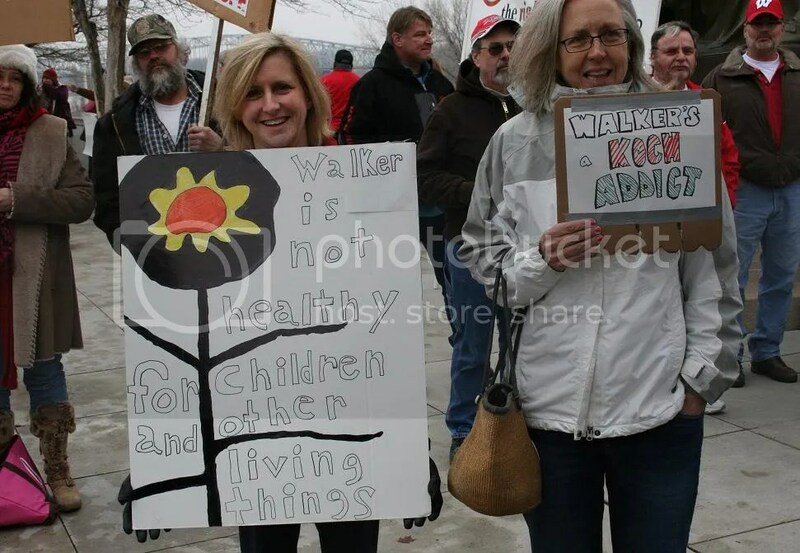 Walker is not healthy for children and other living things. A article in today’s St. Louis Post-Dispatch surveying the field of GOP Senate hopefuls who came out for the annual GOP Lincoln Day dog-and-pony show confirmed that Ann Wagner is, indeed, leaning toward putting her hat in the ring. No real surprise there. It also, somewhat unexpectedly (to me at least), mentioned Rep. Todd Akin (R-2) as a possible Senate candidate. Fall-out from the possible changes redistricting could wreak on his district perhaps? In what would be a bizarre face-about, it was earlier suggested that Wagner might be the GOPer in his primary race. I’m betting that it would certainly go a long way toward reconciling the Democratic base to DINO Claire McCaskill if she ended up facing the wingnut’s wingnut, Akin, should he manage to weather the primary. I personally would genuflect every time she entered St. Louis County. Steelman, a former state treasurer and state senator from Rolla, said she is “absolutely not” considering shifting to another statewide race if the Senate contest gets crowded. Is this maybe just a coded way of asking candidates like Steelman and Martin if they would defer should the party manage to find a candidate (like Wagner?) who would be more viable in the general election? Or is it just some species of GOP sexism that the question was seemingly asked of the only other female candidate? Of course, nobody would be foolish enough to ask Martin if he would step aside for Wagner – since, as he himself declared about himself, “I don’t see anybody that’s better at retail politicking and raising the money.” Hmmm …. retail politicking. Is that where pols put themselves up for sale to the highest bidder? Indications of the lunatic fringe, on a vehicle parked near the teabagger rally on the south side of the capitol building in Jefferson City. 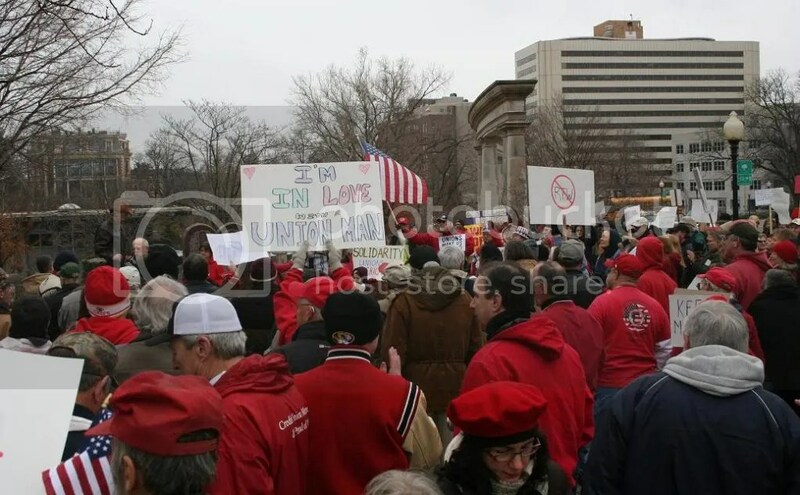 On this Saturday the 26th of February the communist organization moveon.org is organizing a rally in Jefferson City to support destroying our nation through deeper debt in the name of “protecting the working man”…. 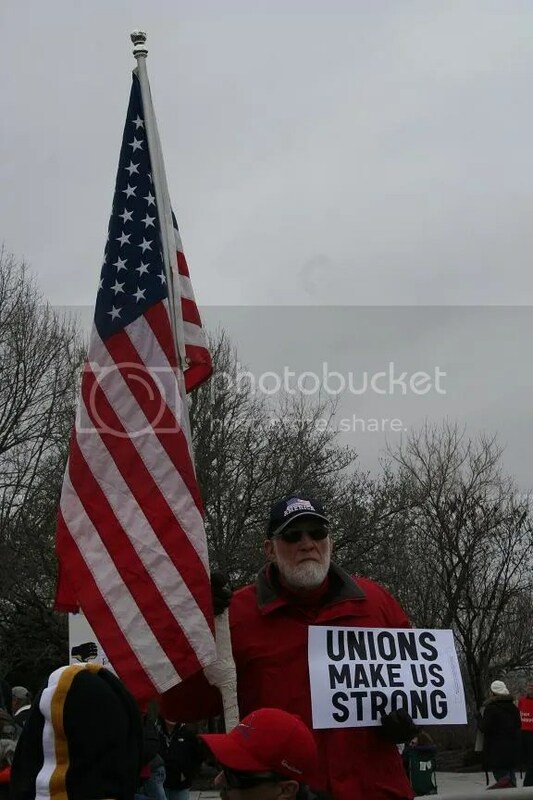 I heard one of the speakers at the teabagger rally say the same thing, so, I thought I’d talk to some of the good working people at the MoveOn organized labor rally on the opposite side of the capitol. 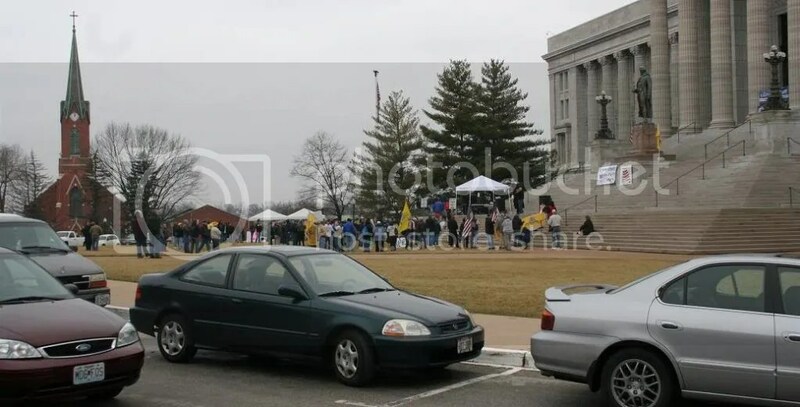 The MoveOn organized labor rally on the north side of the capitol in Jefferson City. Robert Shoemyer : I heard there was gonna be a rally here to support the people of Wisconsin. Show Me Progress: And you decided to show up? Robert Shoemyer : I decided to show up. Show Me Progress: What does, uh, what does collective bargaining mean for you? Robert Shoemyer : I farm. And, but, collective bargaining, I mean, I’ve always been in favor of collective bargaining. I mean, without labor nothing would happen. So, I mean, you have to have your salesman, you have to have your labor. But then that’s it. 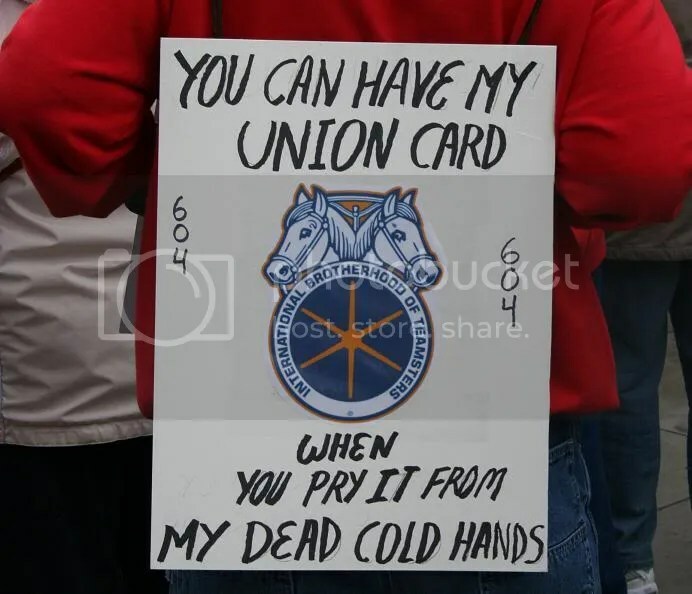 You’ve got to love the Teamsters. ….Show Me Progress: …What’s your affiliation. Rod Herrmann: I’m with the Gas Workers 11-6 out of St. Louis. We represent with Laclede Gas, a public utility. Show Me Progress: Uh, why are you here today? Rod Herrmann: In support of unions and all working people. We deserve a fair shake. Uh, feel like, uh, we’re getting railroaded here a little bit and, uh, you know, we want to, we want an honest wage for an honest day’s worth of work. And, uh, it seems like the working man is being pushed down and put back. 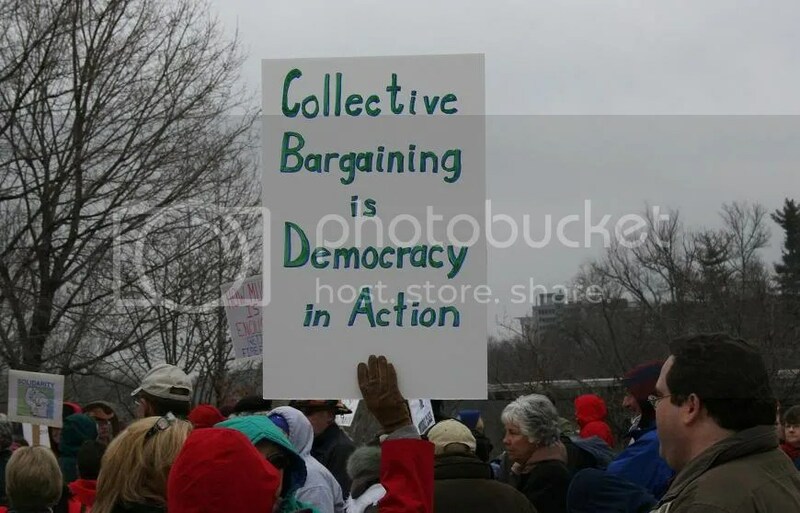 Show Me Progress: What does collective bargaining mean to you? Rod Herrmann: It means a contract with good benefits, good wages. Uh, you know we’re not asking for the world, we’re just asking for what we feel we deserve. Uh, it’s a, it’s a tough situation out there now a days with, uh, being competitive. And, uh, unions, uh, when they bargain, they bargain for safety, uh, productivity, we know, we’re not against any of those issues. And those are what big business wants and we spend a lot of money on training our members in safety and productivity. Something we all want. Show Me Progress: The group on the other side, uh, uses rhetoric, uh, that sort of labels, um, the people over here. One of the terms that one of speakers said was that, uh, that there are, there are communists over here. Trying to, you know, agitate. Have you run into any communists that you know of? Rod Herrmann: No, I don’t think there’s a communist in this group. Jimmy Hoffa pretty much sums that up for us in his day, uh, you know, there’s no communists here, uh, they’re basically riding the backside of the union worker that’s blazed the trail, uh, for the future of my kids and my grandkids. Uh, they’re just looking for a free ride. Show Me Progress:All right. Well, thank you very much for your time. Wayne Parsons: To stand up for the, uh, for the people up in Wisconsin. Show ’em that I’m their side, we’re on their side and we believe like what they believe. 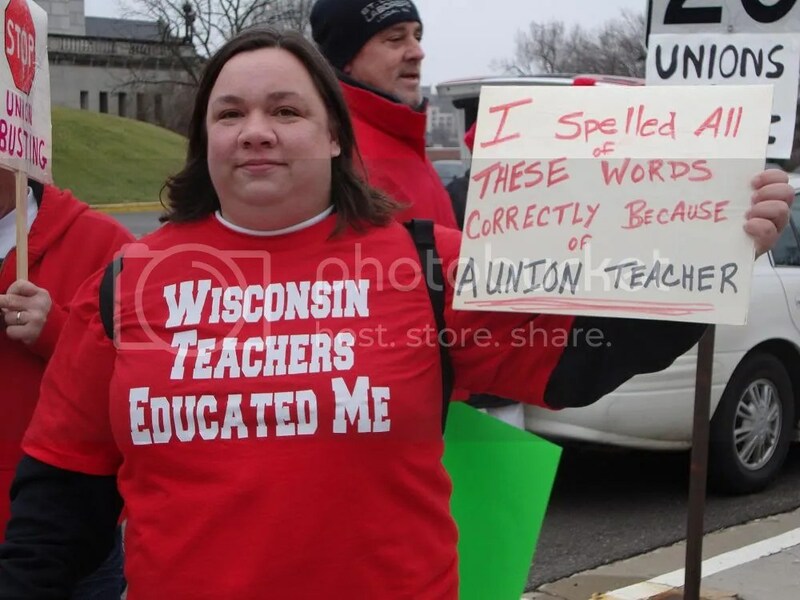 Show Me Progress: Um, what does collective bargaining mean for you? Wayne Parsons: That means, to me, that means you’ve got people that can stand up against the bullies, that they can’t overrun you, and that you can fight for a right to, to, you know, to receive what you deserve. Show Me Progress: …The, the folks on the other side, um, they use some interesting rhetoric. Uh, they’ve said that, uh, that they think that the communists are, are, uh, organizing this group over here. Have you noticed any communists around here? Wayne Parsons: Ah, I don’t believe there’s, really, I don’t really believe there’s any communists in America. And one thing about it, we’re all Americans. We’re not communists, we’re not socialists, we’re Americans. We’re people. You know, we want to be free. Communism is not free. We want to be free. 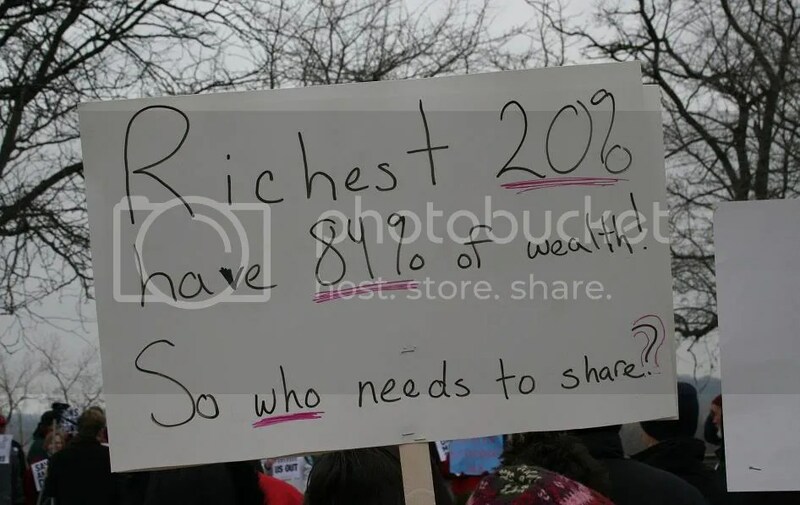 We don’t want the rich man to tell us what we should do or not do. We want to be able to, to be free. Show Me Progress: …Well, thank you very much for your time. Chad Smith: Well, standing up for the middle class, for what’s right. It’s just plain common sense really. Show Me Progress: Uh, what’s your affiliation? Chad Smith: Uh, IBEW, Local 2. Show Me Progress: And Local 2 is where? Chad Smith: In St. Louis. Show Me Progress: St. Louis. Show Me Progress: What does, what does collective bargaining mean for you? Chad Smith: Well, it means my whole life. It means, uh, everything that the middle class has to work for. I mean, without it, you know, you got corporations, they got millions to sit around and have attorneys on retainer and, uh, regular working Americans can’t afford to have attorneys on retainer. 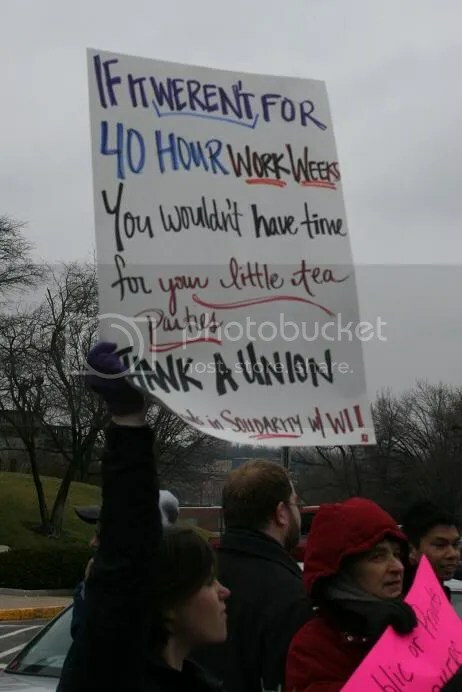 And that’s what unions are there for, so, to make a level playing field for everybody. 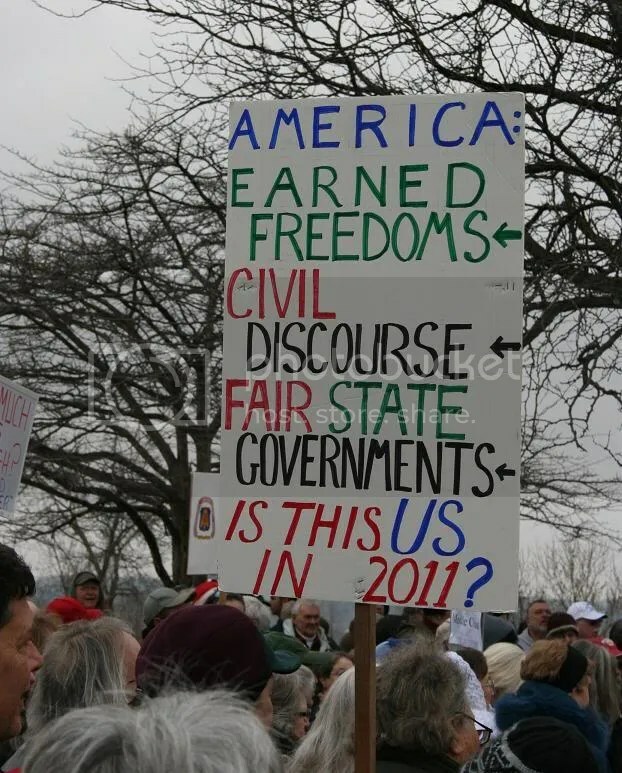 Show Me Progress: Now, now the folks on the other side use some rhetoric that’s, uh, they think that, that, that this organization over here, this, this crowd here is, uh, basically being prompted by people that have motives, uh, other than what you state. They use the term, calling the people that are organizing this communists. Have you noticed any communists over here? Chad Smith: I haven’t seen a one. Actually, I , I seen the guys on the south side and, uh, it’s pretty much, you know, basically all I got to say about them is, uninformed voters. Show Me Progress: Well, thank you very much for your time. Bobby Wright: I’m from Local 1887 in St. Louis, UAW. 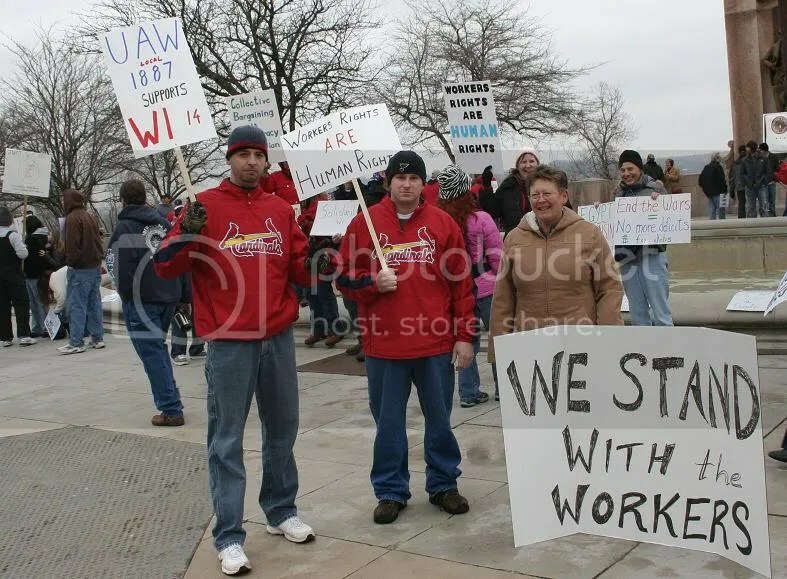 Uh, we came down to show our support for the Wisconsin fourteen and the Wisconsin, uh, public service employees. And, uh, we think what’s going on here’s an attack on the middle class. I think it’s shameful of where our government’s headed. It seems to be organized by corrupt corporate agenda. And, uh, basically I’m just fed up with it. You know, I’m out here, show my support for what’s going on in Wisconsin. Show Me Progress: Uh, what does collective bargaining mean for you? aining means for me, is that, uh, as a worker on the lowest level we can collectively get a voice on, uh, efficiency and operations within corporations ’cause we are on the front lines of, of their ability to make money. 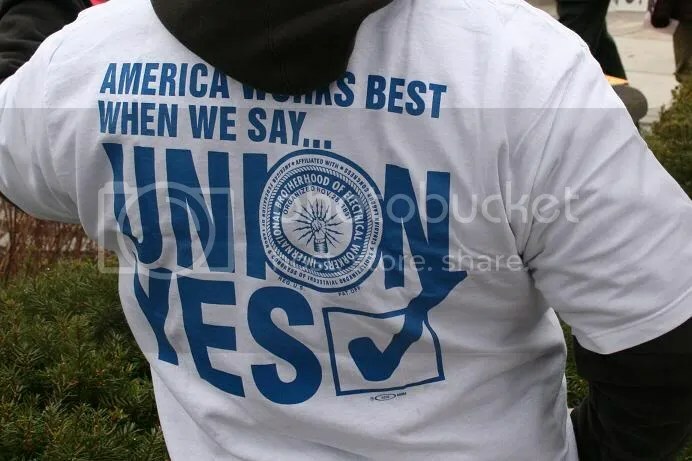 In my opinion, uh, as a union employee we don’t thrive unless the company survives, so we’re, we’re, our best interest is that the company stays involved and, in collective bargaining issues so that we can progress as a, as a community within the corporation. And talking away that right pretty much, uh, leads to what I would call a dictatorial state, not necessarily Democracy. 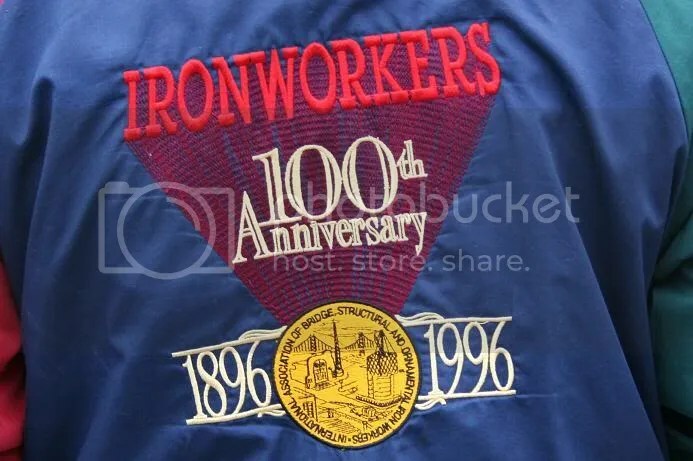 And that’s just my opinion and, and, you know, the way it’s headed I think the more information that gets out there I think we’re headed to a renewed labor movement. And I think it’s best what’s for the middle class. It’s a shrinking conglomerate. And, uh, and any time we can step forward as a society and start to get informed on what goes on at the highest levels I think we’ll be better off. Show Me Progress: All right, thank you very much for your time. Sprinkler Fitters and Sheet Metal Workers. 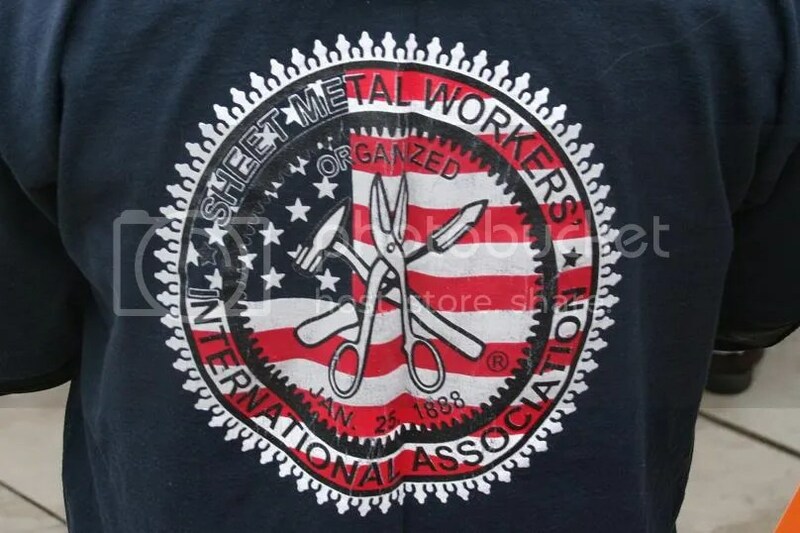 International Association of Bridge, Structural, Ornamental and Reinforcing Iron Workers. 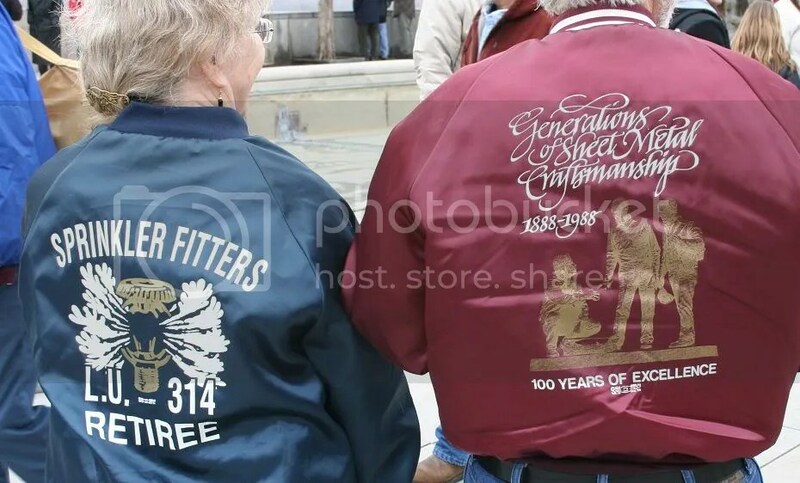 Those are working people’s jackets. And, and communists, too, so there. There is a distinct difference between the south side and north side groups, eh? J Street continues to establish itself as a political force that’s increasingly being listened to in Washington DC. In only three years, the newly formed progressive Jewish-American advocacy organization has amassed an impressive record of growth-and last night kicked off its second DC conference to a packed house at the Washington Convention Center. Over 2000 participants has turned this annual event into the largest pro-Israel, pro-peace gathering ever, including 500 students from more than 100 Universities, 50 members of Congress, and 170,000 supporters nationwide. The recent uprisings unfolding in the Middle East have brought particular attention to this year’s conference. J Street calls for governance to be based on human rights, dignity, democracy-all familiar notes-albeit strikingly elusive in many of the region’s nations, including Palestinian territories under Israeli control. #1 We stand proudly with and for the people and the state of Israel. #2 We believe that the future of Israel depends on achieving a two-state resolution to the conflict with the Palestinian people. #3 Israel’s supporters have not only the right but the obligation to speak out when we think the policies or actions of the Israeli government are hurting Israel or harming the long-term interests of the Jewish people. #4 We believe that vibrant but respectful debate over Israel benefits the American Jewish community. #5 We must ground our work in the values on which we were raised. All this talk around should we ‘debate’ or ‘dare to criticize Israel’, might seem a little out of place in 21st century America, but the fact remains, there have been many concerted efforts to shut down debate over US-Israel policies, or any criticism of the internal affairs of Israel-especially concerning its treatment of the Palestinian people in occupied territories of West Bank and Gaza. The millennial march of cultural progress establishing human rights, freedom, does not stop to satisfy the needs of a few engaged in organizational power struggles or political squabbles. Our social and political world is an ever-changing canvass that ebbs and flows, and indeed, with Tunisia, Egypt, Libya, we are witness to the indefatigable will of human dignity as an unstoppable force elevating global society. J Street works to amplify these democratic trends to strengthen Israel, not weaken her-and if anything’s clear by the last few weeks-the desire for freedom embraced by those denied it, is a juggernaut that no force or fear can turn away. It was cold. But the day in Jefferson City exceeded my expectations. There weren’t very many teabaggers, though they did have banners and a beefy sound system. Do you think some billionaire patrons paid for that through an astroturf front organization? Just asking. Today really wasn’t about the speeches. It was about showing up. 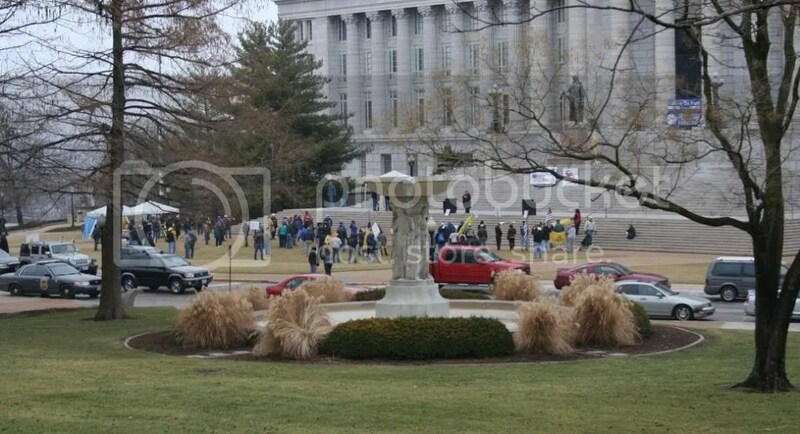 Though a teabagger speaker seemed a tad bit concerned about the “communists” on the other side of the capitol. 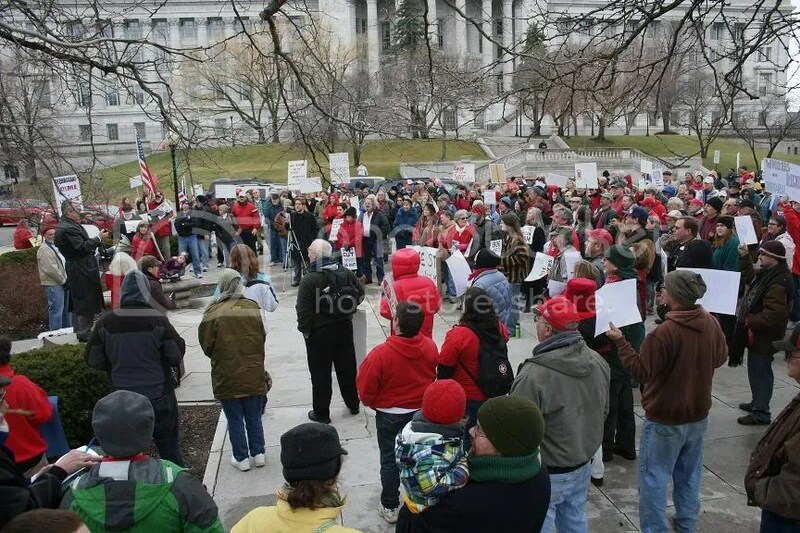 The teabagger rally in support of republicans and corporate interests on the south side of the capitol. The organized labor folks on the north side of the capitol had greater numbers and one barely audible bull horn. I estimate the MoveOn organized labor crowd numbered from 350 to 400. 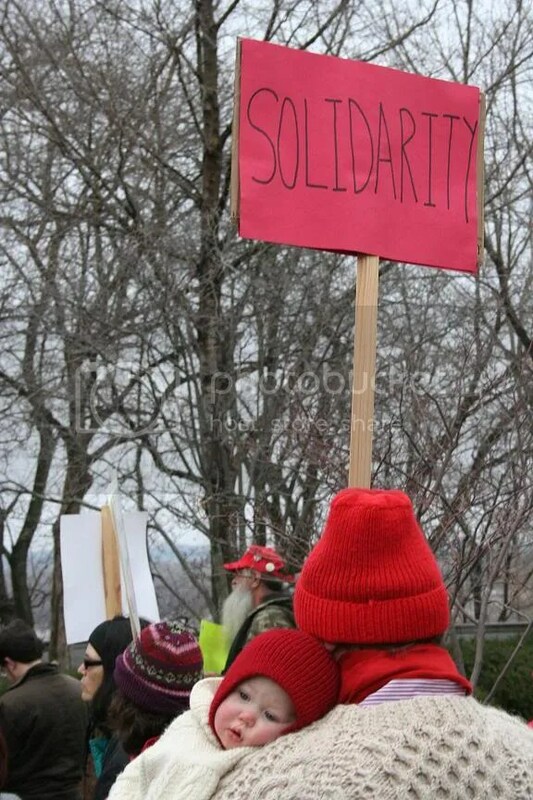 The MoveOn and organized labor rally in support of Wisconsin workers on the north side of the capitol. 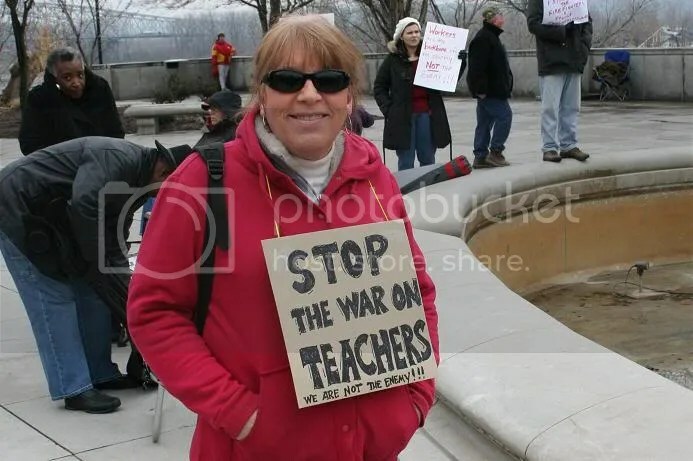 Stop the war on teachers, we are not the enemy. On the north side of the capitol. On the north side of the capitol. 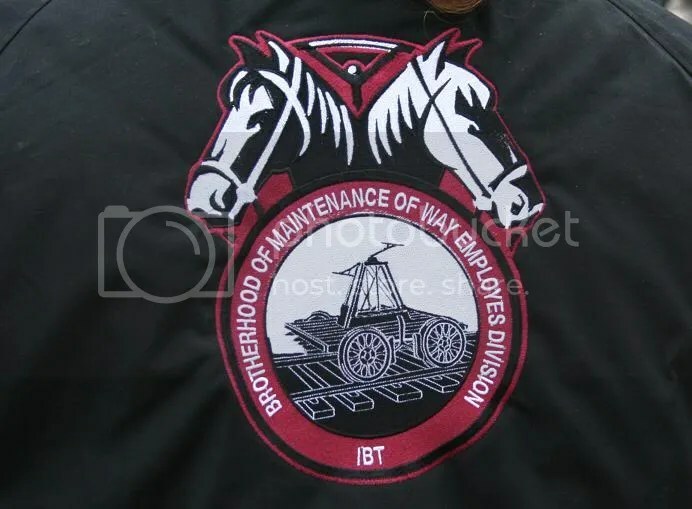 I’m in love with a union man. On the north side of the capitol. 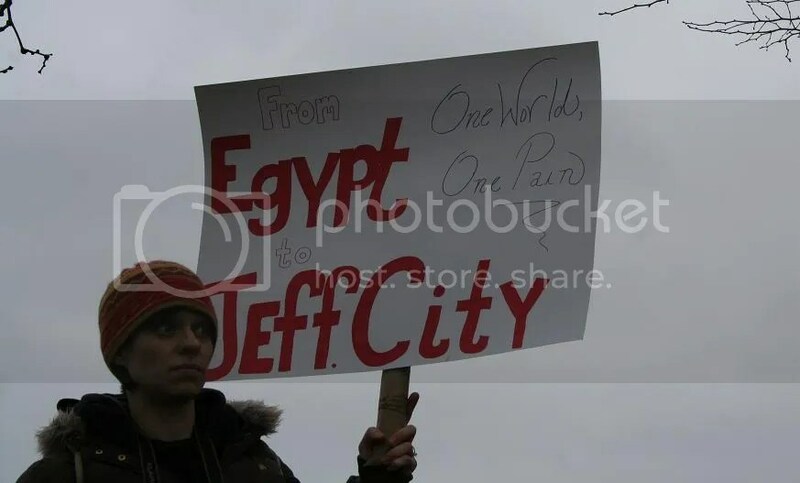 From Egypt to Jeff City. One world, one pain. On the north side of the capitol. 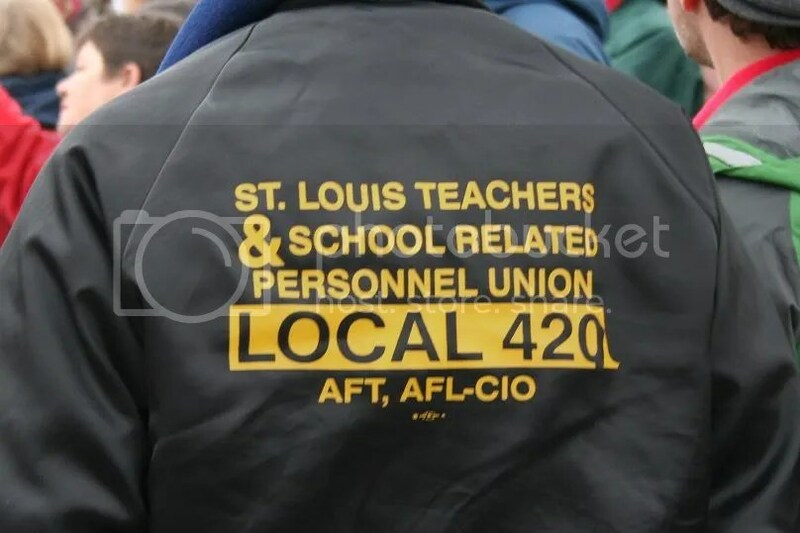 Mo public workers in solidarity. On Wi[sconsin]! On the north side of the capitol. 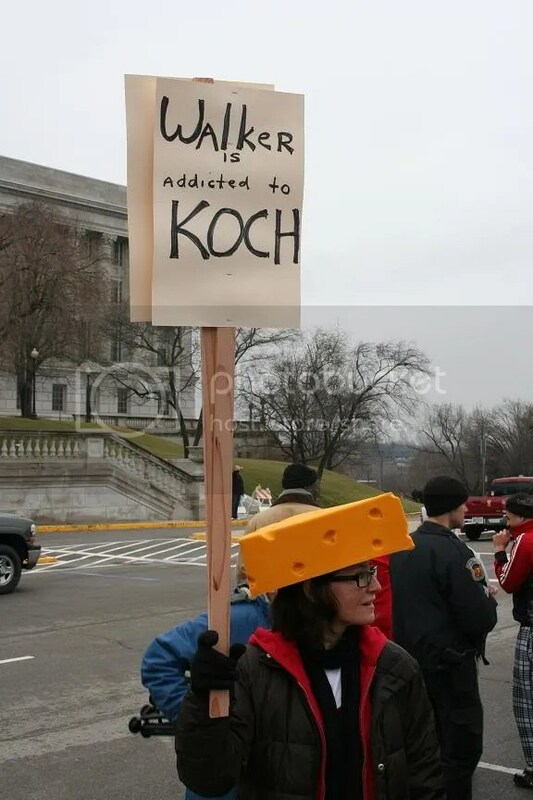 Walker is addicted to Koch. On the north side of the capitol. 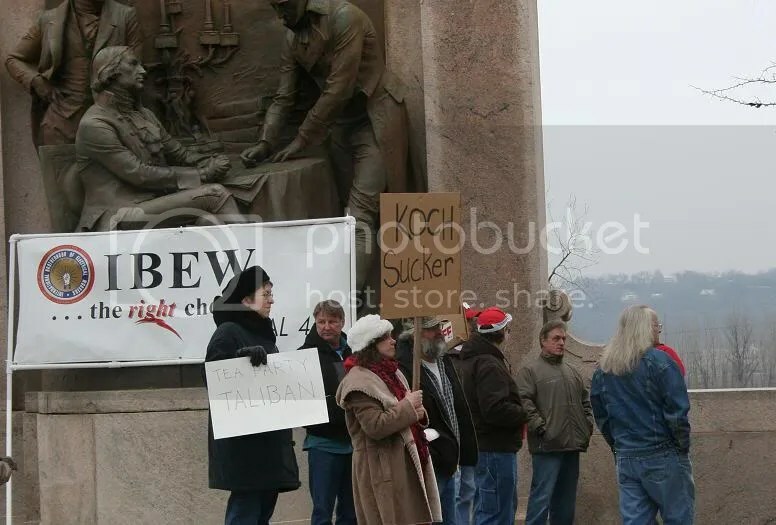 Tea party Taliban. Koch sucker. On the north side of the capitol. 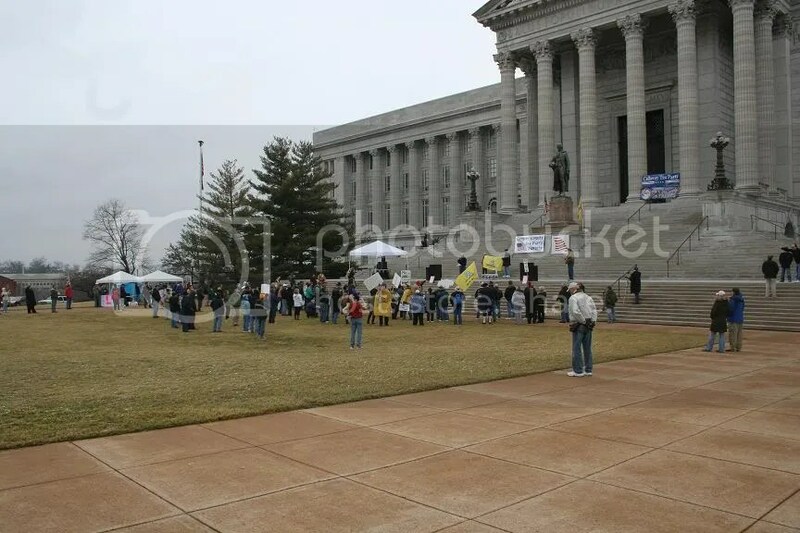 The teabagger rally. On the south side of the capitol. On the south side of the capitol. Paid for by FREEDOM PAC, James Thomas, Treasurer © Copyright 2011 KANSAS CITY TAX REFORM. Ah, they’re one of those right wingnut front groups that wants to defund everything. Ah, the usual suspects. Now, if we could only figure out who is bankrolling their bankrollers. Surveys, staff, a web site! Any bets they’re planning on a monster direct mail campaign? Cute kid in the video, right? Based on what Phyllis Schlafly has to say about feminism and marriage, she might just be her Schlafly’s worst nightmare – a happy little girl who knows that she has a wide open future and that she needn’t be defined by her marital status. Hotflash recentlly posted several videos showing Schlafly, the Queen Mum of Missouri conservatism, in action (here, here and here). They present a frail-seeming, fact-challenged woman, absurdly flailing at the the Affordable Care Act. A Huffington Post interview on the topic of Schlafly’s new book, The Flipside of Feminism: What Conservative Women Know – And Men Can’t Say, cowritten with Suzanne Venker, serves to reinforce one’s sense that this woman is seriously out of touch with reality. She and her co-author, like many social conservatives, view divorce as something that superficial women, seduced by empty feminist platitudes, embrace simply because they can. Consequently, Schlafly and her ilk have devoted themselves to making sure that they can’t. Here in Missouri, for example, Schlafly think-alike, Cynthia Davis, introduced legislation to eliminate no-fault divorce, and in her role as Chair of the House Interim Committee on Poverty issued a trumped-up report that reduced a complex, many-faceted issue to the scourge of unmarried motherhood. There seems to be no social pathology that these folks can’t explain by reference to women’s sexual behavior and marital status. Social conservatives who want to meddle in people’s marriage choices often claim that they do so because prohibiting divorce is in the best interest of children. Proponents of this view usually trot out various studies that purport to demonstrate the dire future outcomes for children of divorce and Schlafly doesn’t disappoint, citing Judith Wallerstein’s highly publicized, but questionable research. Based on the interview, I’m betting that Shclafly’s book offers little more than the latest iteration of the perennial rightwing Kinder, Küche und Kirche propaganda – bolstered by the usual misrepresentation and twisted logic that we expect from the less thoughtful social conservatives. Schlafly can, on one hand, lambast the family court system, which often oversees custody disputes, as an example of government overreach, “an arm of government that exercises virtually unlimited power to dictate the private lives and income of millions of Americans.” On the other hand, she openly asserts the right of government to legislate morality when it comes to limiting divorce. The question for us, of course, is do we want the Schlaflys of the world to be our moral arbiters? Do we want our children, children like the little girl above, bound by her view of female destiny? … if right-wing activists have thrown a months-long tantrum over Michelle Obama encouraging kids to eat healthier foods, how will these same activists perceive a presidential candidate who wants to press parents to get married, whether they want to or not? I’m guessing that if they notice at all, they’ll praise him to the skies. They don’t even bother trying to hide the insanity anymore. INTRODUCED BY REPRESENTATIVES WELLS (Sponsor), POLLOCK, FRAKER, RIDDLE, CURTMAN, FRANZ, LOEHNER, SCHOELLER, WRIGHT, KLIPPENSTEIN, DENISON, FLANIGAN, TILLEY, DIEHL, ALLEN, GATSCHENBERGER, SCHAD, WYATT, LAIR, HOSKINS, THOMSON, STREAM, LARGENT, GUERNSEY, DUGGER, LASATER, FISHER, BAHR, PHILLIPS, SATER, ELMER, GRISAMORE, PARKINSON, BERRY, KELLEY (126), LONG, SMITH (150), LICHTENEGGER, ENTLICHER, DAVIS, BRATTIN, CRAWFORD, CAUTHORN, NETH, LANT, REIBOLDT, BROWN (85), FUHR, REDMON, JOHNSON, BERNSKOETTER, JONES (117), CIERPIOT, BRANDOM, ASBURY, WALLINGFORD, LEARA, LAUER, McNARY, HIGDON, HOUGHTON, FAITH, KEENEY, FITZWATER, FRANKLIN, HINSON, LEACH, HAMPTON, MEADOWS, DAY, SILVEY, BURLISON, JONES (89), RUZICKA, KOENIG, McGHEE, SCHATZ, CROSS, SHUMAKE, FUNDERBURK, WIELAND, SCHARNHORST, CONWAY (14), ZERR, HAEFNER, BROWN (116), FREDERICK, CASEY, SCHIEFFER, CONWAY (27), ATKINS, McDONALD, McMANUS, HODGES, HARRIS, TAYLOR, AULL, SWEARINGEN, WEBB, FALLERT, NANCE, WETER, MARSHALL, SCHIEBER, COOKSON, ROWLAND AND SCHNEIDER (Co-sponsors). Submitting to the qualified voters of Missouri an amendment repealing section 1 of article V of the Constitution of Missouri, and adopting one new section in lieu thereof relating to the judicial department. Section 1. The judicial power of the state shall be vested in a supreme court, a court of appeals consisting of districts as prescribed by law, and circuit courts. The courts provided for in this section, when exercising their judicial authority, shall uphold and adhere to the law as provided in the United States Constitution, the Constitution of Missouri, the United States Code, federal regulations promulgated pursuant thereto, and if necessary the law of another state of the United States, provided the law of the other state does not include Sharia law, in making judicial decisions. The courts shall not look to the legal precepts of other nations or cultures. Specifically, the courts shall not consider international law or Sharia law. The provisions of this section shall apply to all cases before the respective courts, including but not limited to cases of first impression. That would explain some people’s attitudes about torture being permissible and acceptable. Uh, Great Britain was not the United States in 1803 and it still isn’t now. There’s obviously no hope of the Missouri General Assembly making any timely progress on passing the state budget and job creation initiatives is there? The headlines out of the Census data release include SW Missouri is growing, St. Louis isn’t growing and Kansas City gets to be the largest city in Missouri. But what about the current State House and Senate districts (used for the 2002 through 2010 elections and due to be modified for 2012 through 2020)? The ideal population for a Missouri Senate district in the next redistricting is around 176145. Three districts are over 200,000 people: SD2 (St. Charles/Lincoln), SD20 (Counties surrounding Springfield, but not Springfield), and SD8 (Blue Springs/Lee’s Summit). Three districts are under 150,000 people: SD14 (North St. Louis County), SD9 (Kansas City) and SD4 (St. Louis City). These districts have 166000 or fewer people: SD21 (Lafayette, Saline, Ray, Carroll, Cooper, etc), SD7 (STL County, in-between West and North County), SD10 (Kansas City, shaped like an overhead projector), SD18 (Northeast Missouri), SD13 (North County STL), and SD5 (STL City). State Senate redistricting splits very few counties (Jefferson, Greene, Clay, STL County, STL City, and Jackson County). Soon people will mess around with the countyswapping needed to get a map that doesn’t violate one-man one vote. Amongst districts entirely in one county, SD22 (McKenna, termed out in 2014) is almost exactly fine as it is. SD3 (Engler, termed out) needs a few thousand more people. SD33 (Purgason, termed out) needs to shed some population, which would go to SD3 or SD25 (Mayer, termed out). SD27 (Crowell, termed out) also needs some more people. Sensing a trend in the area’s legislative team? Jackson County is 30,000 below the ideal population to support four state senate districts, so one of the four districts should go into another county. In an ideal world. As for the State House.. the ideal district will have 36742 people in it. The districts we have in place vary from 72365 people (HD13) to 27412 (HD61). The Math experts reading this can deduce that HD13 could almost be split in 2 and be legal (as of now, it’d need to be split in two with some parts taken from other populated St. Charles County districts). The House districts with under 30000 people are HD43 (KCMO), HD64 (STL), HD41 (KCMO), HD60 (STL), HD57 (STL), and HD61 (STL). The least populated district not in Jackson County or the city of St. Louis is HD78 (30572 people) in Northwest STL County. HD162 (New Madrid) has 31602 people. Eight House districts have between 45769 and 58725 people. The biggest of these is HD35 in Clay County. HD19 in Calloway County has almost 50,000 people. HD134 in Greene County has 48531. HD11 (Lincoln County) has over 48,000 as well. HD142 (Christian/Taney Counties) has 47928 people. HD24 (Boone County, Chris Kelly) has 46896 people. HD141 (Christian, Lawrence and Stone Counties) has 46328 people and HD38 (Clay County) had 45769. 61 of 163 districts are above the ideal total of 36742. Keep in mind that these districts were all around 34K when drawn after 2000. Things change. So essentially there’s going to be some creative line drawing to get the suburbs and SW MO under 37K while getting the urban districts up to the totals needed. The number of districts in KC and STL is probably gonna go down as well. Jackson County can fit around 18 districts into the county, down from the 19 Jackson County districts after 2000. STL City can fit 8 districts completely in the city limits with room to make up the majority of a district with STL County. Right now STL City has 8 whole districts, 3/4ths of a district, and half of a 10th district. For the sake of comparison, St. Charles County can now fit 9 whole districts with the majority of a 10th, up from having 8 entire districts. Feel free to dig around the American Factfinder website to figure out more about the results of the 2010 Census. In Wisconsin and around our country, the American Dream is under fierce attack. Instead of creating jobs, Republicans are giving tax breaks to corporations and the very rich-and then cutting funding for education, police, emergency response, and vital human services. This Saturday, we will stand together to Save the American Dream. Be sure to wear Wisconsin Badger colors-red and white-to show your solidarity. Sign up today to join in! 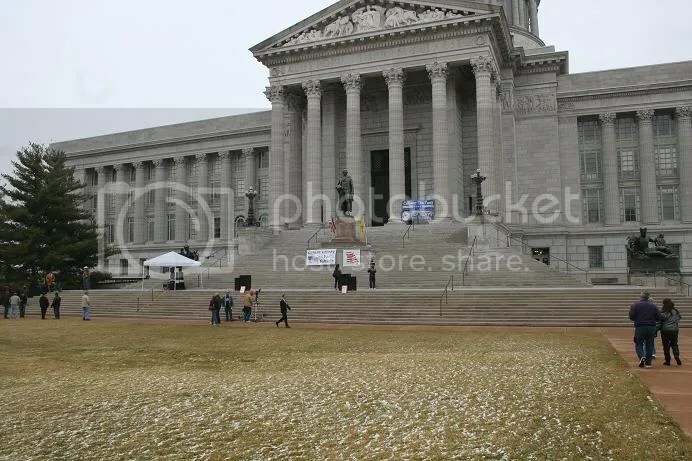 The left via moveon.org and OFA are organizing protests in Jefferson City this Saturday, so the St. Louis Tea Party Coalition is joining the call from Tea Party and 9-12 groups across the state to counter protest on the capital steps. Speakers are still being scheduled for Saturday. We will meet about 10:30AM to stake out our ground. The moveon.org rally is scheduled to for noon. Bring signs, banners, and bottled water/snacks. We have to draw the line now before the fiscal problems in the country worsen. 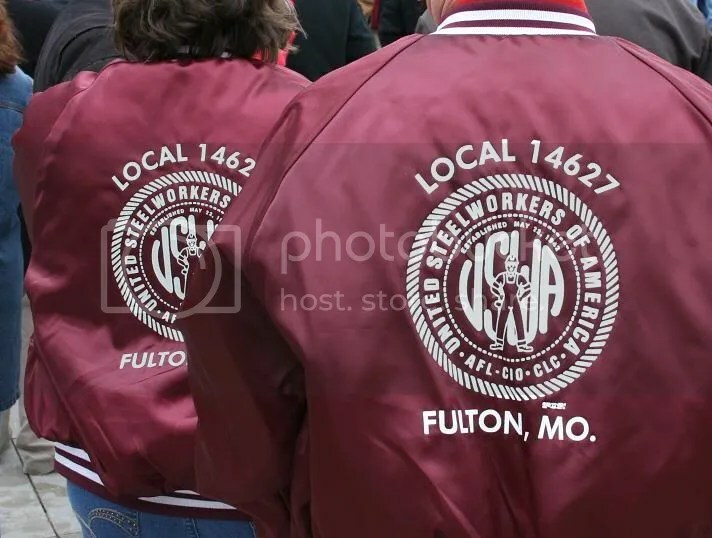 With Right-to-Work (RTW) legislation pending in Missouri, we have to support our conservative legislators. We can do that Saturday as we stand with fellow patriots from around the state to show our support for Gov. Scott Walker and the conservative legislators of Wisconsin who are trying to restore fiscal sanity. On this Saturday the 26th of February the communist organization moveon.org is organizing a rally in Jefferson City to support destroying our nation through deeper debt in the name of “protecting the working man”. It is very, very important that you and I, the true lovers of freedom and liberty, step up to the plate and let our voices be heard! We are tired of having our government being hijacked by a small minority! 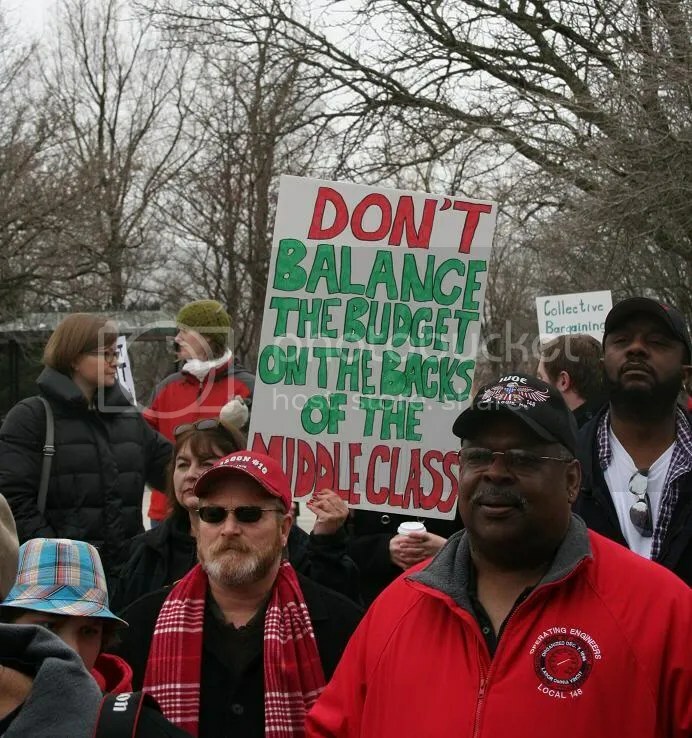 We are tired of the middle class always having to pay for the unions’ demands of higher and higher wages, which they continue to demand even though those wages and benefits are 2 or 3 times higher than that of the private sector or fair market value! We want to STOP driving ourselves and our posterity into crushing debt just because some people refuse to tighten their belts!…. I thought accusing someone of being a communist went out with high button shoes. Evidently not for fascists. 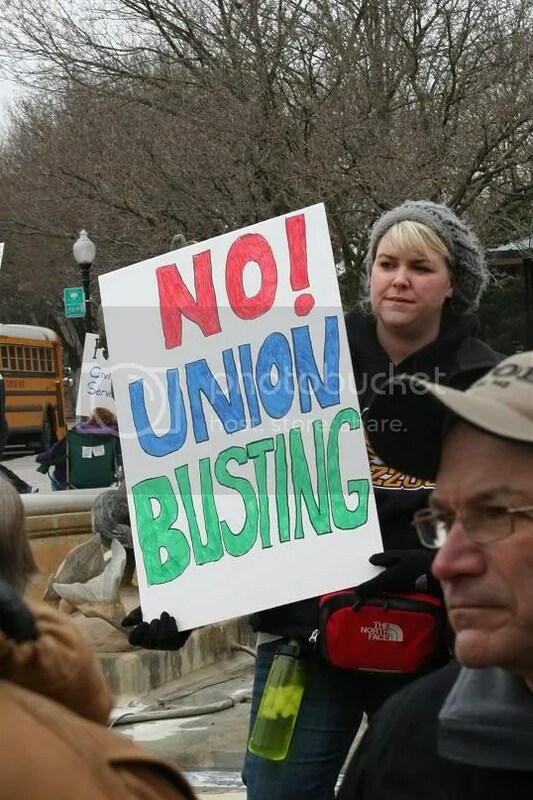 Now, they did write “union” and not “public”, but since they are organizing against the MoveOn rally in support of public sector collective bargaining in Wisconsin it’s probably safe to assume they were including public sector employees in the mix. Are workers in the public sector really overpaid and too comfy for their own good? According to a new study from the Center for State and Local Government Excellence and National Institute on Retirement Security, not really. Analysis of Bureau of Labor Statistics data showed that state and local government employees are generally better-educated than their counterparts working in the private sector, but earn less overall, even including benefits such as health care and pension plans. * Public and private workforces differ in important ways. For instance, jobs in the public sector require much more education on average than those in the private sector. Employees in state and local sectors are twice as likely as their private sector counterparts to have a college or advanced degree. * Wages and salaries of state and local employees are lower than those for private sector workers with comparable earnings determinants (e.g., education). State employees typically earn 11 percent less; local workers earn 12 percent less. * Over the last 20 years, the earnings for state and local employees have generally declined relative to comparable private sector employees. The pattern of declining relative compensation remains true in most of the large states we examined, although some state-level variation exists. * Benefits (e.g., pensions) comprise a greater share of employee compensation in the public sector. State and local employees have lower total compensation than their private sector counterparts. On average, total compensation is 6.8 percent lower for state employees and 7.4 percent lower for local workers, compared with comparable private sector employees.